I've been the civilian coordinator for the 21st Michigan for ten years now, and I am very pleased at the direction our ever-growing group has taken. When I began this reenacting trek 12 years ago, the civilians of the 21st were mainly a few women - less than a dozen - who tended to follow and cook for the men. With me being the sole active male in our unit, I was a rarity, for there were very few civilian men in any unit! 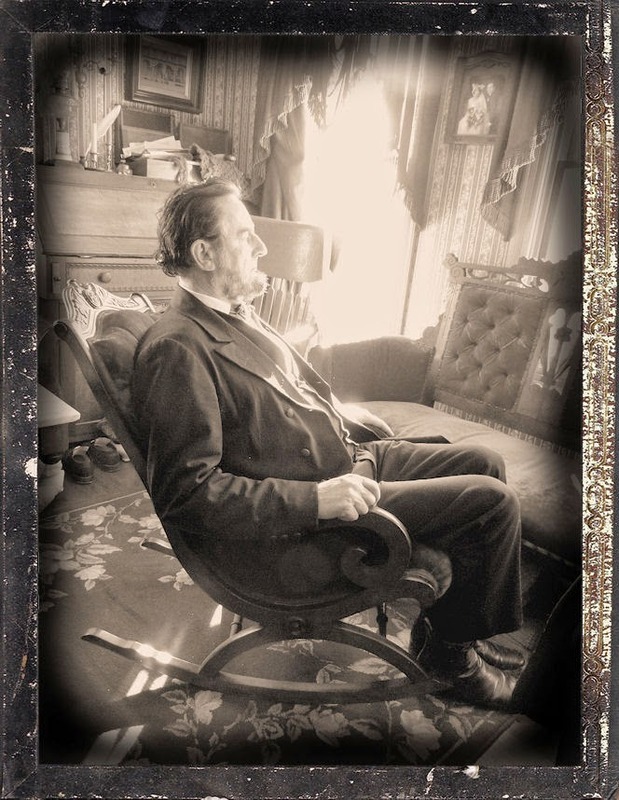 Since then we've become a viable force of over 60 citizens representing the 1860s reenacting/living history world, which now includes numerous men as well. 21st Michigan Civilians: a wonderful group of people! 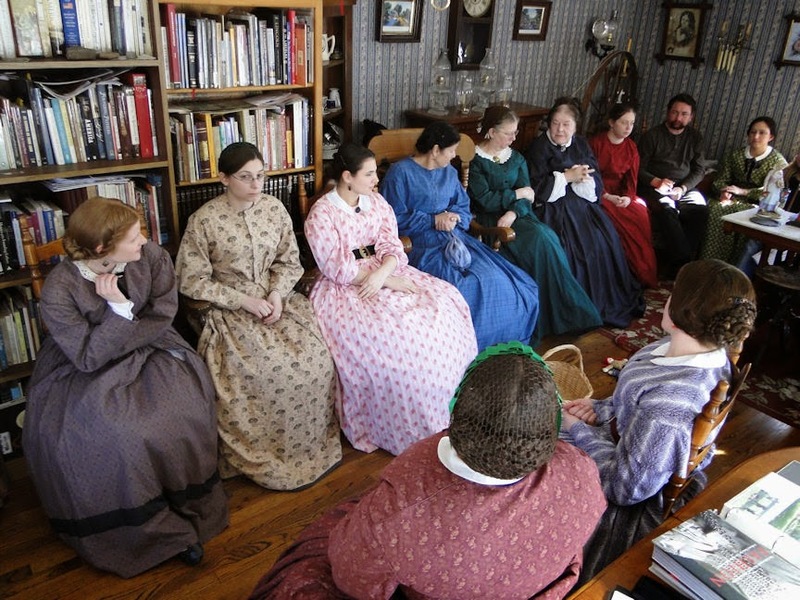 And while many reenacting civilian groups also have meetings, they tend to be modern dress and concentrate on projects such as quilt making or sewing - great things for women, I suppose, but hardly something I man would like to take part in. I know this to be true for I've heard it first-hand (I also know not all groups are like this, but truth be told, most are). 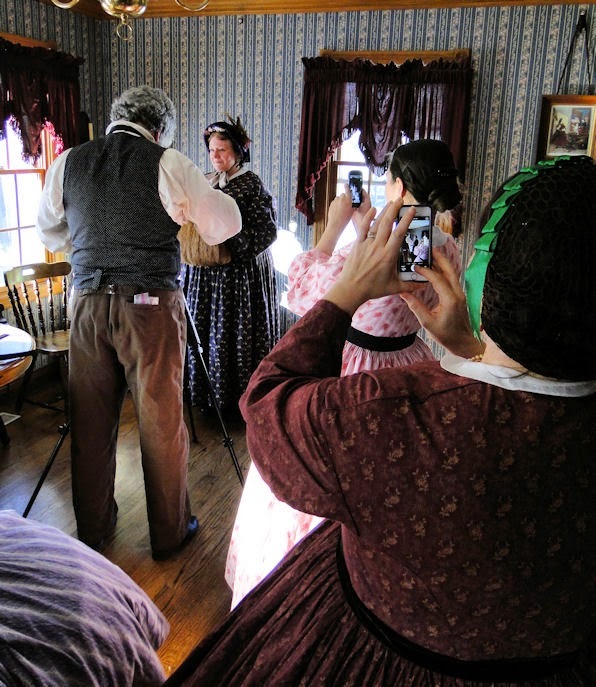 The 21st Michigan civilian meetings lean heavily toward the promotion of the study of social history - everyday life - and how to present this in a fun and interesting manner to the visiting public. Our meetings are also for all civilians - not just for women or just for men. Numerous times it's been suggested that we have separate meetings for men and women so men can learn and do period men things and women can learn and do period women things. I disagree - why have a separate meeting? Then it becomes a men's club or a women's club, and that's the last thing we want to see happen. Nope - our 21st Michigan civilian meetings are all inclusive - heck, we even have some military show up so they, too, can learn about their lives beyond the military. (I'm not speaking of men's or women's social gatherings here, by the way - we're talking about a unit meeting). It's a difficult task, you know, to oversee such a large contingency of 1860s citizens. By oversee I don't mean I'm their boss or that I tell them what to do. I only make suggestions, for "taking control and telling members what they have to do" is not the job of a coordinator. 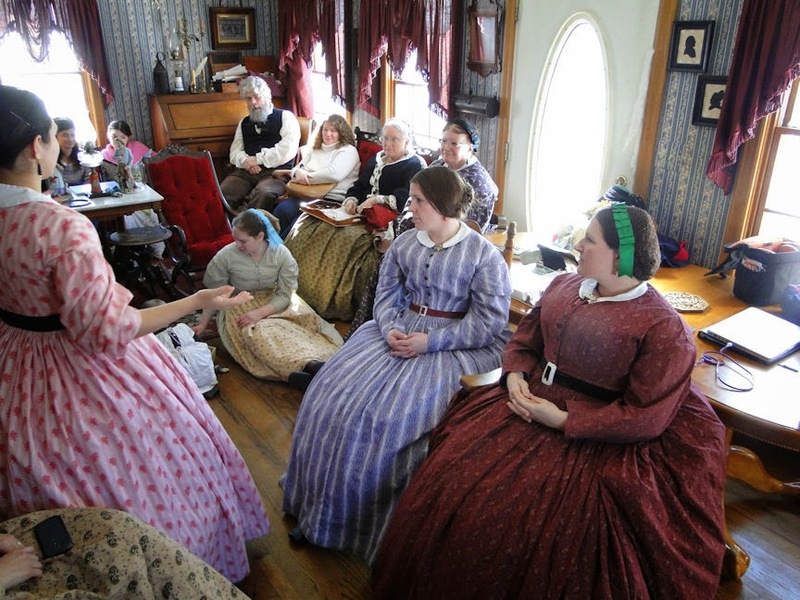 ~much like the military drills, period dress meetings are a sort of drill for those of us on the homefront, where we can improve our presentation and hopefully gain new knowledge and insight in showing the past to visitors. 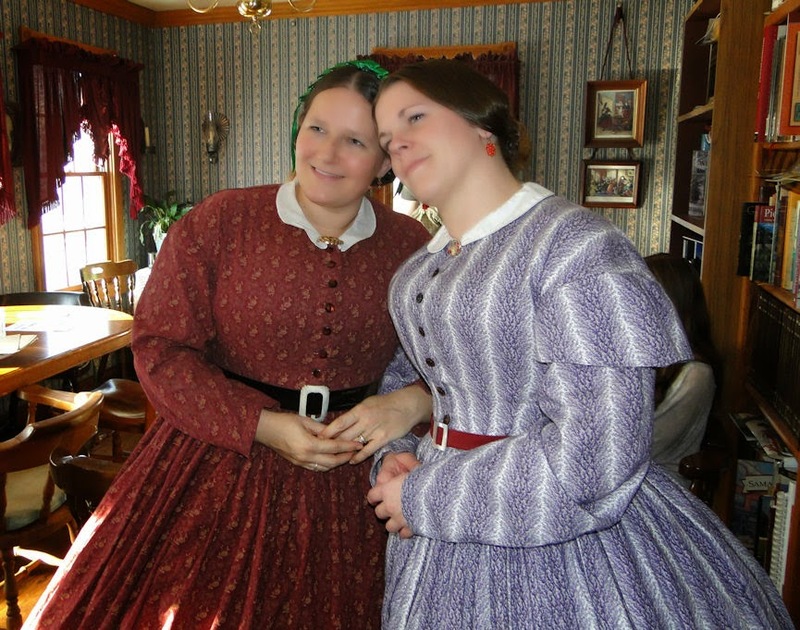 ~being in period clothing helps us to remain in focus; it can be difficult to act like a 21st century person while in 19th century clothing. Try it sometime - it just doesn't feel right. 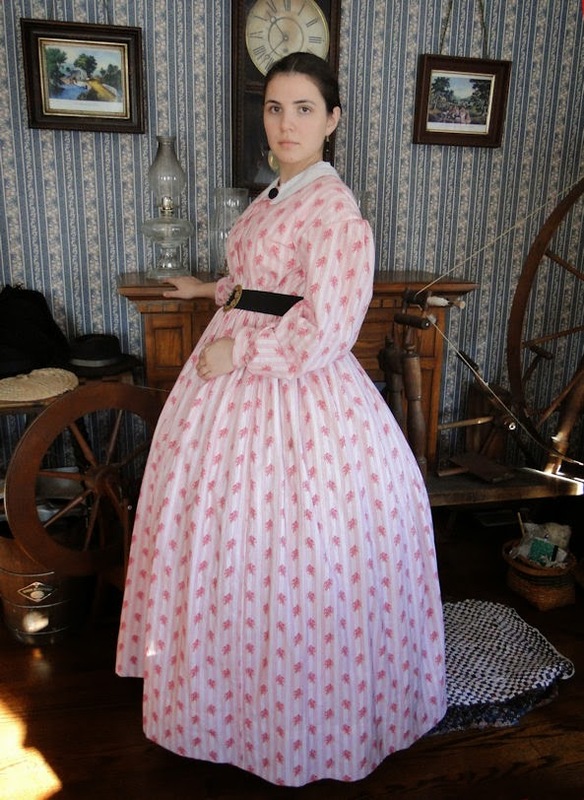 ~sometimes it just feels good to throw on your period clothing when you may not have worn them for months and visit with your 19th century friends without feeling as if you're on display. But the main course of action is to learn how to present history comfortably in knowledge and in presentation. And that's what this year's civilian meeting was about: how to have exciting public presentations without doing 1st person. If you recall in the previous Passion for the Past posting, I wrote about how many accredited history majors do not take reenactors seriously, considering us nothing more than fluff and hobbyists. Of course, we know better than that, and as I stated, most of us intently study the past, many times more often and more detailed than some history majors. That being said, my subject for this year's meeting was knowledge. I began by stressing that knowledge has to be thee top priority here; knowing about the time period you are presenting - absolutely knowing - can make all the difference in how serious you are being taken. 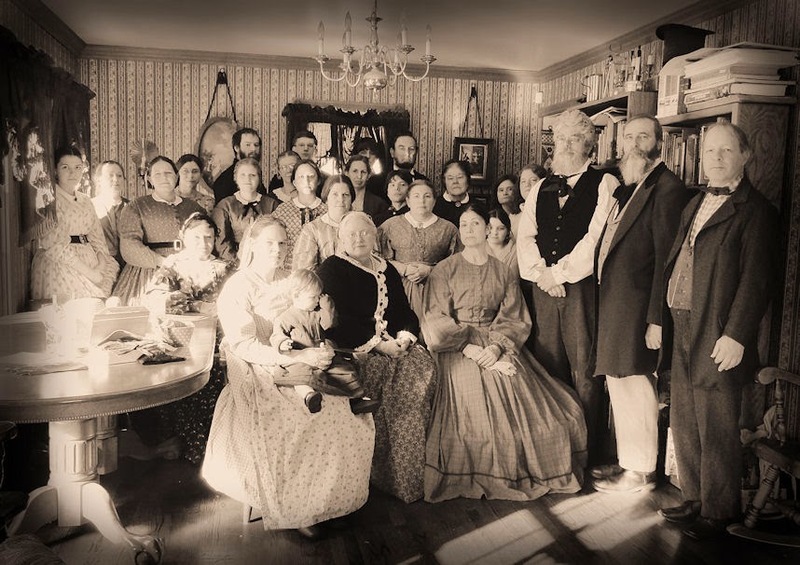 As I've written in older postings, too many focus solely on clothing or quilting or sewing...but what I've imparted on the civilians of the 21st Michigan is to look beyond the obvious. Yes, clothing is important, but it only tells a small part of the story. To give a more complete picture one needs to look at the 1865 world around them - put themselves in that world - and then they will be able to develop more fully a presentation of greater interest for not only the general public, but for themselves as well. ~who was the post master and how did he get the position? ~was this his only occupation? If not, what else did he do? ~what did he see when he looked outside his window? ~how did he interact with his family, neighbors, and customers? 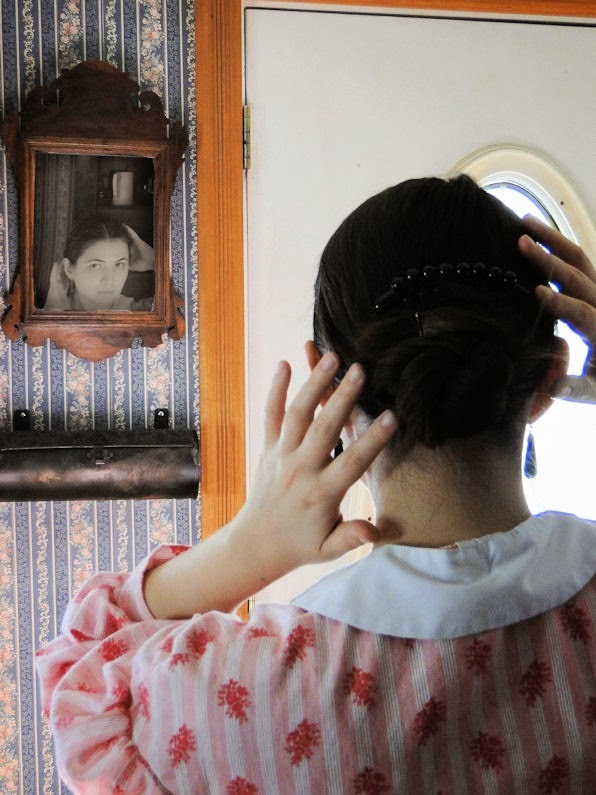 ~how much of a 21st century personality should be a part of a 19th century personality? Just these and a few other simple questions took me on a figurative journey beyond anyplace I expected to go. And it was this knowledge quest that enabled me to reach out and grab the visitor by bringing the past to life in a very real way where they could identify. In fact, there are numerous variables of my 19th century life that I am now able to present. For instance, I run a stagecoach stop, and because of this I also am able to send and receive mail for the locals of my area. 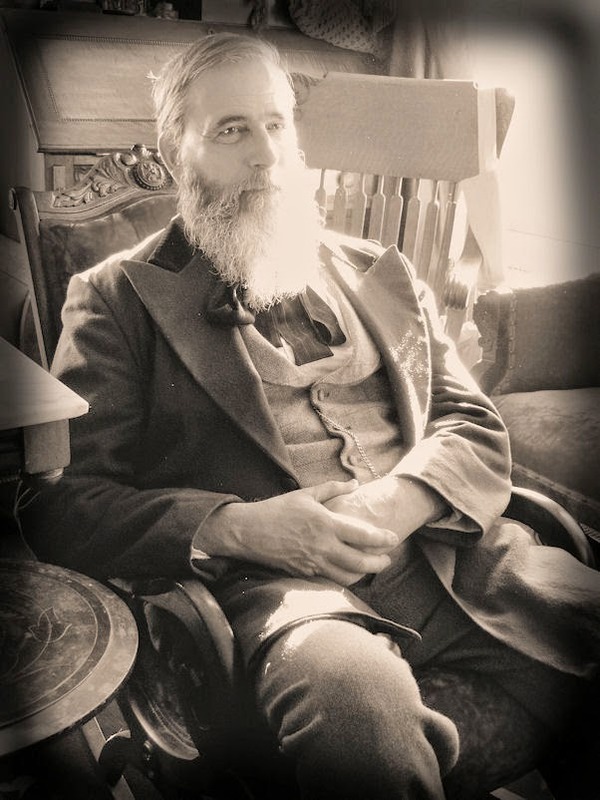 So now I can speak not only of the importance of mail delivery and the subjects of letters themselves in relation to the men off fighting the War, but I also have been able to expand to the subject of 19th century travel and all it entailed during the period as well. Now, let's take it yet to another level: I am also (like so many of this time) a farmer. Depending on the season of the year, there are all sorts of things to talk about including the daily home chores as well as the farming chores of each member of the family, which would include the running of a household from morning til night time along with seasonal farm activity. And to make it all complete, I can also tell of the area I live by researching the history of the city, town, or village in which I currently (in my 21st century life) live and/or grew up, and then incorporating that into my delivery. 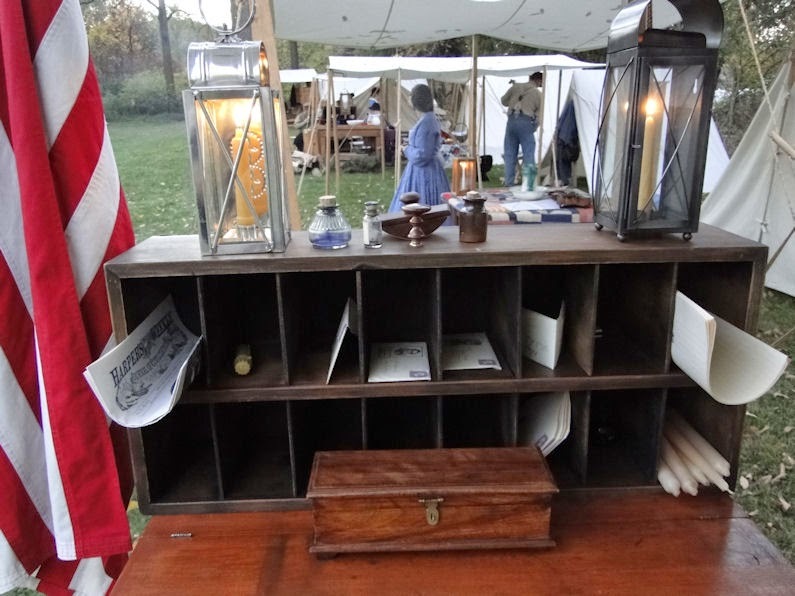 All of this stemming from telling people about the importance of mail writing and delivery during the Civil War. This is what I mean by making our presentations a bit more exciting. And if you are able to add accessories to your overall delivery, all the better. Lanterns and oil lamps will go far, as will other items of the home or work place. I found a friend to make me a pigeon-hole letter holder based on an original from the earlier part of the 19th century - that's it to the left. Also, even simple gestures such as putting your bread, muffins, apples, and other period-correct "snacky" food-stuffs in bowls of the time set out on a table under your fly can also go a long way in the overall appearance. Harper's Weekly, letters, writing utensils, and even period photos and household tools will really accent your space. Having a small bushel of apples and corn will help to give that harvest appearance come fall. A scythe or sickle, maybe an old plow (all can be found fairly cheap at country garage or barn sales) will garner plenty of interest from the visiting public. To me the idea is not only to teach but to stand out in an enticing manner. kitchen set-up under her fly! 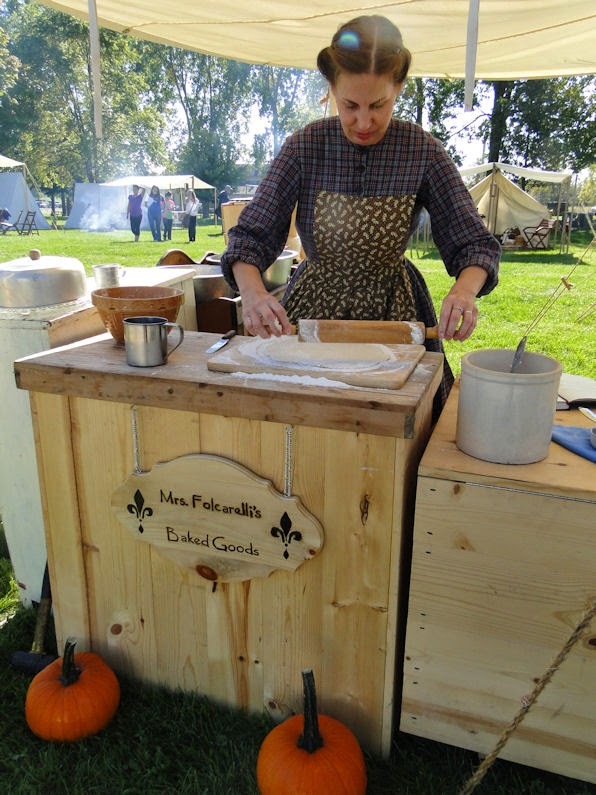 We all know that nearly everyone cooks over an open campfire at reenactments, this is pretty much standard practice, but a few reenactors really stand out in this by turning their tent and fly into a literal kitchen (see right)! And they will include more tools than the standard fry pan; many will also include a dutch oven and a reflector oven (among the other cooking utensils) to show the differing ways of cooking over an open fire or a hearth. Others may bring their iron cookstoves to events, taking the cooking presentation along another historical path. A stove can be another wonderful opportunity to teach about heating and cleaning a stove as well as the different types and sizes of wood used for cooking. 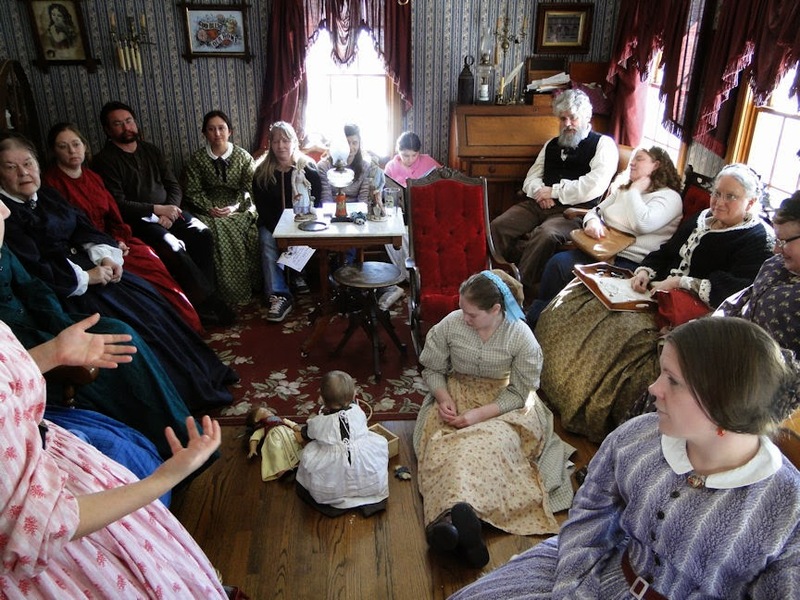 They can even teach a bit about which days of the week were for cooking and which were for baking, giving the visitor an idea of how a household was run. Something else I like to do is reenact seasonally. 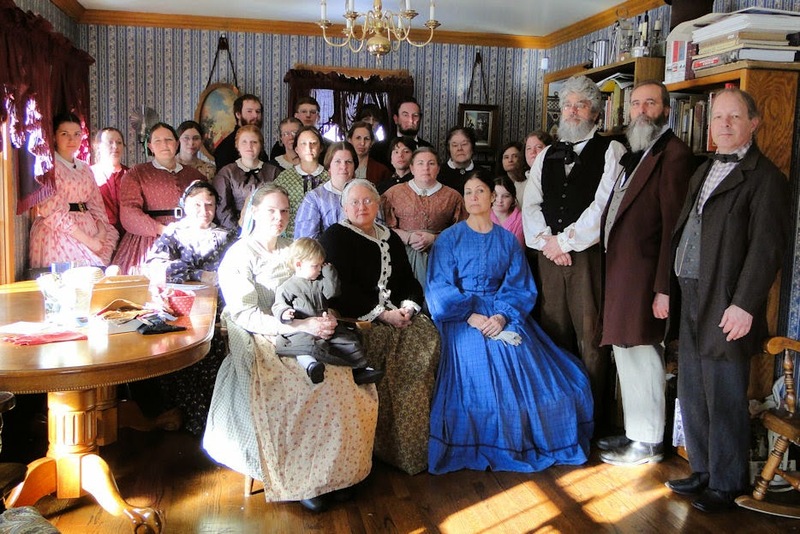 When our "official" reenacting season begins here in Michigan in the merry month of May, I can still speak of late-winter chores & activities and lead right into the spring chores & activities, which will then head into preparation for summer chores & activities. And let's not forget the fall harvest. 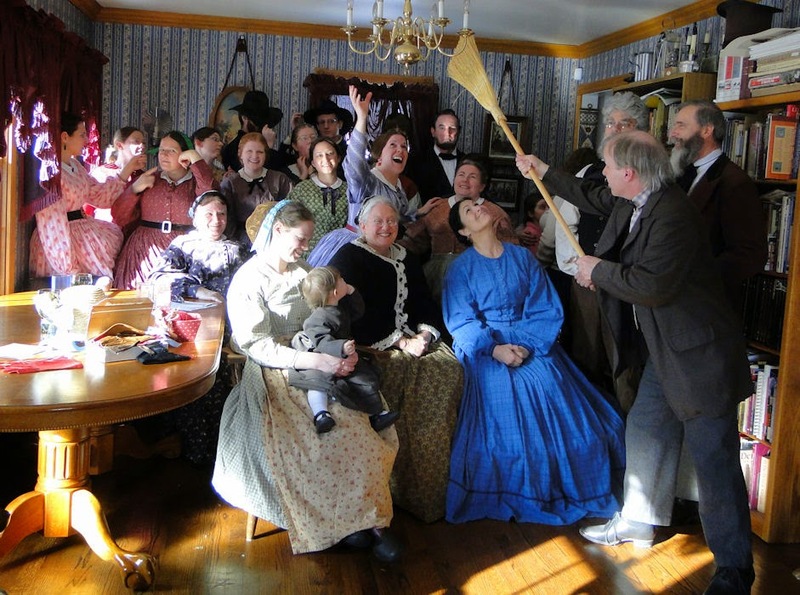 If you recall, in October of 2014 our unit had a fall harvest festival at our last major reenactment, and a majority of civilians from the 21st Michigan actively and excitedly took part in celebrating this time of year in numerous ways. Many have said this was the best reenactment they've ever taken part in. This is the way I try to guide our civilians in the 21st Michigan in bringing the past to life; Mrs. Folcarelli, in the photo above, is just one of our numerous members who does not do 1st person, but she (and other 21st Michigan civilians) have an awesome historically-based set-up and knowledge that more than keeps the visitors interested. It's in this manner where we, as living historians/reenactors, can be considered an equal to the accredited historians; as long as we research the perceived world we intend to present to the public, we can bring their written words inside the history books to life. This is how, in a very real sense, we actually become part of that long-ago world - even without 1st person. And for me, that's what it's all about. I took a picture of Larissa taking a picture of Kristen taking a picture of Robert taking a picture of Violet. Did you get that? These two ladies put the "gans" in sheninagans! We didn't just pose for photos - we did have a meeting, too!! Yes, that's some of my research library you see behind these lovely ladies. Baby Cynthia learned quite a bit, too! 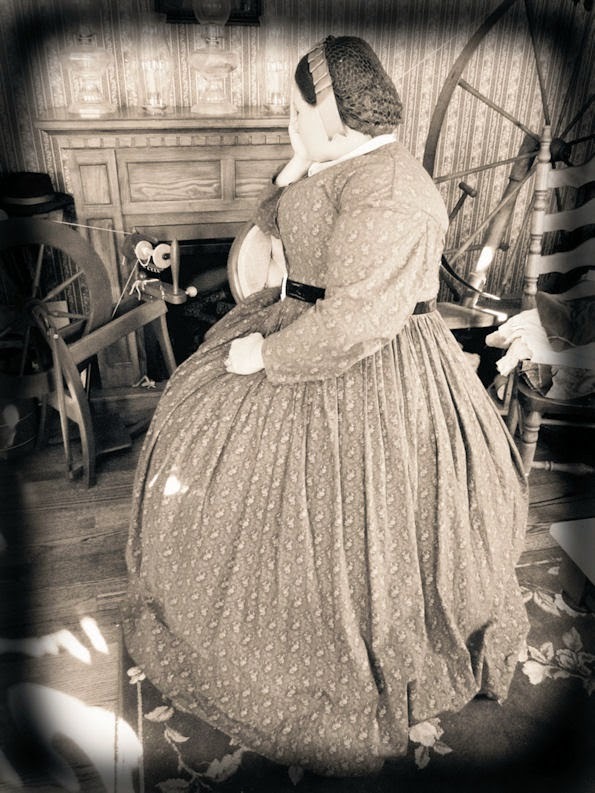 She does an awesome job portraying a one-year-old of the 1860s. Kristen has portrayed my daughter so often that she now uses her hands when she speaks! Your hosts with the mosts - My wife and I: she was not feeling her best on this day but she outdid herself on the wonderful potato soup she made for our guests! We're going to be quite a conversation piece for our grandson and any future grandkids, eh? (To help you figure out your back story and to help formulate a more realistic presentation, please click HERE for a previous posting I wrote. And to read about my back story and how I utilized my hometown's history as well as everyday knowledge of the past, please click HERE.